The 22nd December 2013 marks 25 years of the killing of Chico Mendes, leader of the rubber tappers in Brazilian Amazon and international recognized activist as a defender of the Amazon. The killer, Darcy, and the intellectual author of the crime, his father, Darly Alves da Silva, were both found guilty of the crime, and after spending years in prison, are now free. Charges of other murders they were accused of, were never investigated. Neither a possible involvement of bigger ranchers that at the time represented the ranchers union UDR (today named the CNA). The legacy of Chico Mendes is very much contested. Many politicians were elected following Chico’s ideas in the Amazon, claiming to follow his dreams and his ideas. Some have maybe not acted as exactly as Chico would – as the new gas exploitation in his home state of Acre is about to start, certainly not the best way to preserve the forest for the life of the people of the forest, as Chico would defend. While still alive, Chico Mendes certainly was one of the most prominent leaders of the “environmentalism of the poor”. However, the Chico Mendes’ memory is definitely an on-going struggle and a contested legacy. Who was he, at the end? Which were his ideas, his ideology? Chico Mendes learnt how to read and write with his first teacher, who appeared in his life by chance, the communist Euclides Tavora who was in refuge in the rainforest on the border with Brazil and Bolivia. These first lessons were useful 10 years later. The work of the ecclesial base communities in unifying the tappers, in the 1970s and led by priest Moacyr Grecchi, one of the most prominent and progressive of the Liberation Theology movement, was followed by the formation of first Union of rubber tappers in 1975, build a strong movement that started the “empate”, in 1976, to stop deforestation. 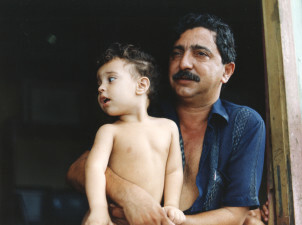 Chico Mendes helped to organize a movement that would claim the right of the people of the forest to stop deforestation and live in the environment. What Chico learned with Távora has been decisive to the future not only to the rubber tappers, but of the “environmentalism of the poor” worldwide. The kind of environmentalism that seeks to defend a form of existence that requires the environment it depends upon. Chico Mendes used to say that they started defending the rubber tapper, and afterwards the trees, then they realized they were defending the Amazon, and the whole Planet. Francisco ‘Chico’ Alves Mendes Filho was born on December 15, 1944, in a rubber estate in Xapuri, Acre, in northwestern Brazil. He married Ilzamar G. Bezerra Mendes and they had two children, Elenira was four and Sandino was two when their father died. He was member of the National Council of Rubber Tappers and committed to the defence of the Amazonian ecosystem. In 1985, he advised the World Bank and the Inter-American Development Bank on Amazon development projects. In 1987, he received the Global 500 Prize from the United Nations and a medal from the Society for a Better World, New York. In 1988, he was awarded honorary citizenship of Rio de Janeiro. At 5:45 p.m. on Thursday, December 22, 1988, Chico Mendes, trade union leader, rubber tapper, and ecologist, was assassinated in the doorway of his home in Xapuri, Acre. The best way to learn more about Chico is to listen to Chico himself. Two great documentaries on the web are among the best sources of information. One is Voice of the Amazon, from Miranda Smith, that can be watched in English and with Spanish subtitles. From Adrian Cowell, a close friend of Chico, the film “Chico Mendes: Eu Quero Viver”, the Portuguese version of the original “Chico Mendes: I want to live”, can also be seen online. In Portuguese, the University of São Paulo offered a wonderful talk given by Chico a couple months before his death. As many say in Brazil: they killed Chico Mendes, but not his ideas. socialist unity, and put an end to all the enemies of the new society. Here remains only the memory of a sad past of pain, suffering and death. Excuse me—I was dreaming when I wrote of these events, which I myself will not see. But I have the pleasure of having dreamed. ADRIAN COWELL, The Decade of Destruction, Hodder & Stoughton, Sevenoaks, 1990. SUSANNA HECHT and ALEXANDER COCKBURN, The Fate of the Forest: Developers, destroyers and defenders of the Amazon, Verso, London, 1989. LATIN AMERICA BUREAU, Fight for the Forest: Chico Mendes in his own words, Latin America Bureau, London, 1989. ANDREW REVKIN, The Burning Season: The murder of Chico Mendes and the fight for the Amazon rain forest, Collins, London, 1990. ALEX SHOUMATOFF. Murder in the Rain Forest: The Chico Mendes Story. London: Fourth State, 1991. GUMERCINDO RODRIGUES: Walking the forest with Chico Mendes: Struggle for Justice in the Amazon, (2007) (edited, translated and with afterword by Linda Rabben). U. Texas.